Enough heat to power hydrothermal activity inside Saturn's ocean moon Enceladus for billions of years could be generated through tidal friction if the moon has a highly porous core, a new study finds, working in favour of the moon as a potentially habitable world. A paper published in Nature Astronomy today presents the first concept that explains the key characteristics of 500 km-diameter Enceladus as observed by the international Cassini spacecraft over the course of its mission, which concluded in September. This includes a global salty ocean below an ice shell with an average thickness of 20–25 km, thinning to just 1–5 km over the south polar region. There, jets of water vapour and icy grains are launched through fissures in the ice. The composition of the ejected material measured by Cassini included salts and silica dust, suggesting they form through hot water – at least 90°C – interacting with rock in the porous core. These observations require a huge source of heat, about 100 times more than is expected to be generated by the natural decay of radioactive elements in rocks in its core, as well as a means of focusing activity at the south pole. The tidal effect from Saturn is thought to be at the origin of the eruptions deforming the icy shell by push-pull motions as the moon follows an elliptical path around the giant planet. But the energy produced by tidal friction in the ice, by itself, would be too weak to counterbalance the heat loss seen from the ocean – the globe would freeze within 30 million years. As Cassini has shown, the moon is clearly still extremely active, suggesting something else is happening. "Where Enceladus gets the sustained power to remain active has always been a bit of mystery, but we've now considered in greater detail how the structure and composition of the moon's rocky core could play a key role in generating the necessary energy," says lead author Gaël Choblet from the University of Nantes in France. In the new simulations the core is made of unconsolidated, easily deformable, porous rock that water can easily permeate. As such, cool liquid water from the ocean can seep into the core and gradually heat up through tidal friction between sliding rock fragments, as it gets deeper. Water circulates in the core and then rises because it is hotter than the surroundings. This process ultimately transfers heat to the base of the ocean in narrow plumes where it interacts strongly with the rocks. At the seafloor, these plumes vent into the cooler ocean. One seafloor hotspot alone is predicted to release as much as 5 GW of energy, roughly corresponding to the annual geothermal power consumed in Iceland. Such seafloor hotspots generate ocean plumes rising at a few centimetres per second. Not only do the plumes result in strong melting of the ice crust above, but they can also carry small particles from the seafloor, over weeks to months, which are then released into space by the icy jets. Moreover, the authors' computer models show that most water should be expelled from the moon's polar regions, with a runaway process leading to hot spots in localised areas, and thus a thinner ice shell directly above, consistent with what was inferred from Cassini. "Our simulations can simultaneously explain the existence of an ocean at a global scale due to large-scale heat transport between the deep interior and the ice shell, and the concentration of activity in a relatively narrow region around the south pole, thus explaining the main features observed by Cassini," says co-author Gabriel Tobie, also from the University of Nantes. The scientists say that the efficient rock-water interactions in a porous core massaged by tidal friction could generate up to 30 GW of heat over tens of millions to billions of years. 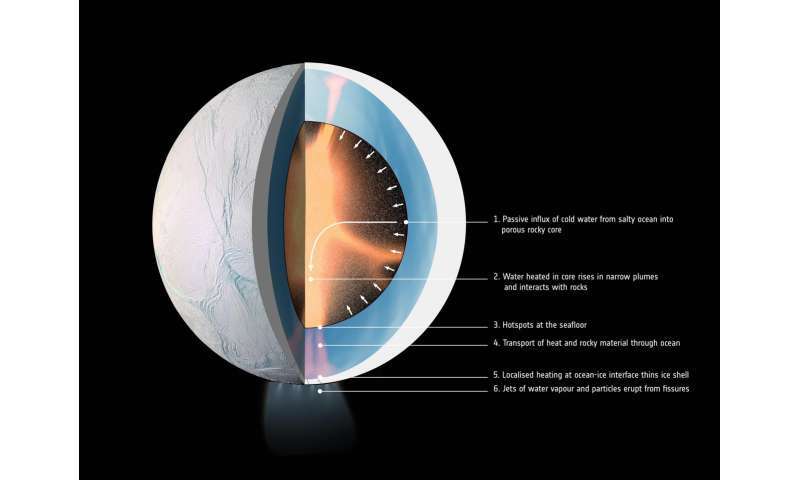 "Future missions capable of analysing the organic molecules in the Enceladus plume with a higher accuracy than Cassini would be able to tell us if sustained hydrothermal conditions could have allowed life to emerge," says Nicolas Altobelli, ESA's Cassini project scientist. A future mission equipped with ice-penetrating radar would also be able to constrain the ice thickness, and additional flybys – or an orbiting craft – would improve models of the interior, further verifying the presence of active hydrothermal plumes. "We'll be flying next-generation instruments, including ground-penetrating radar, to Jupiter's ocean moons in the next decade with ESA's JUICE mission, which is specifically tasked with trying to understand the potential habitability of ocean worlds in the outer Solar System," adds Nicolas. Yep, and adding more ad hoc explanations to save face in the gravity only assumptions isn't going to fix the problem. Just as on Jupiter's Io, it is electric currents flowing through these moons which cause electric discharge processes to create these phenomena. They aren't ions though. Atoms are electrically neutral. Lol. 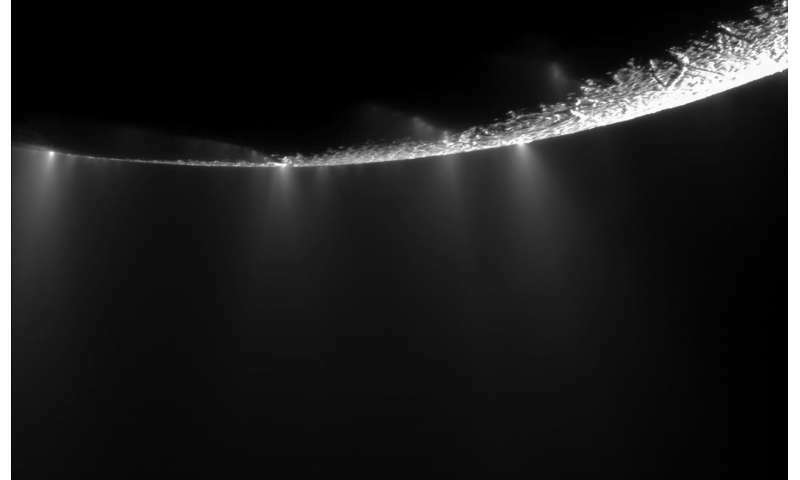 As if we didn't already know that the plumes from from Enceladus were H2O! Kind of dumb, yes? Still, we are dealing with electric universe loons here. Yes? As if we didn't already know that the plumes from from Enceladus were H2O! "In theory, it's extremely easy to make water from hydrogen gas and oxygen gas. Simply mix the two gases together, add a spark or sufficient heat to provide the activation energy to start the reaction, and presto!" So... after a big explosion involving all the hydrogen and oxygen which aren't seen anywhere near Enceladus in any great quantities; and after providing a spark (which is never seen anywhere in the vicinity) or "sufficient heat" (source, please? ), we're left with what, exactly? A bunch of water gas/vapour or ice particles, and no means of sustaining what is very evidently a pretty constant flow of water vapour from Enceladus' south pole. You mention a kid's website: only a kid would come up with a one-shot scenario like the one you propose, which provides no mechanism to sustain a process which appears to be nearly constant over time. In fact, none of the EU woo, nor any of its' proponents, can do this. But, the scientists here use what is known (rocks, water), plus the laws of physics, to provide at least a viable explanation. To be fair, that kid's website provides more science than I've ever seen from the EU loons! EU folks do NOT discount the effects of gravity, they include it along with the Magnetic and Electric field effects found in plasma, the two forces tend to add and make more sense than just one. MS Physics shows magnetism as a minor force where with little impact; we see it as a major attractive force. Consider the radio galaxies just found that some exceed 10M LY, and so are each a huge antennae: How much eletromagnetic force is required to have a single structure as opposed to 'Just' gravitic. JUST Gravity cannot explain it all. It is not at all that we disagree with gravity, but consider it to be Just ONE of The Attractive forces and do not ignore the others. EU (a wide range of ideas, not just one) folks are just looking at an expanded toolbox of effects for interpretations of physical phenomenon and not depending on a sudden God-sent big bang (goes against basic physics anyhow) and instead shows how this aparently infinite universe is self-similar at such opposite scales. jonesdumb is of questionable character and will lie through his teeth to protect his relevance, as the data will confirm. Molecular oxygen was found by Cassini before it even went into orbit around Saturn. "Cassini's ultraviolet imaging spectrograph made its initial survey of Saturn's atmosphere late in Dec. 2003 as the spacecraft neared the end of its seven-year voyage to the ringed planet. Along with the expected hydrogen, long known to be the gas giant's major component, the spectrograph detected the presence of oxygen." Through the same processes (electric discharge) which creates the unexpected molecular oxygen on comets (observed) so too do those processes create O on Enceladus. And with those "sparks" which created the Tiger Stripes transmutes H2O, just as on comets. Being that it is very cold some of it is ice, some of it is vapor. NASA admits the Saturn/Enceladus electric currents exist and the discharge of these currents flowing through the body creates these plumes. Contrary to popular belief, these electric currents actually do something. jonesdumb calls it woo, others call it physics. The physics are just too complex for jonesdumb's brain cell, hence he call it woo. In which playground manual is a radio galaxy "a huge antennae (sic)"? Is it the word "radio" here which is confusing you? Do you imagine the galaxy as some kind of radio transmitter which would then need some kind of gigantic antenna to send the radio waves around the Universe? Your EU friends have bamboozled you - they actually have no quantitative predictions at all, and hence no science. And BTW the word is "phenomena" (plural). Those currents do indeed exist, but just because there's some current there doesn't mean you can simply create a scenario out of thin air where "discharges occur within the body". That's careless formulation and hand-waving typical of wannabe scientists who simply don't or can't comprehend how science works. Give us a mechanism whereby such discharges can occur: come up with a model involving materials and their disposition found in the body, electric field strengths, conductivity, dielectric breakdown voltages, amount of water to be found per unit volume, expected heating effects, etc. Write a scientific paper, publish it where anybody can read it (doesn't have to be peer-reviewed), and then wait for others to weigh in with their observations. THAT's how science works. Just sayin' so don't cut the mustard. In such minute quantities that the resulting hydrogen/oxygen mix gas/plasma was virtually a vacuum. Best of luck trying to ignite that with a spark. some kind of radio transmitter which would then need some kind of gigantic antenna to send the radio waves around the Universe? ...well below anything anyone could detect, since there is no state transition in any material at anywhere near such low energies that could be triggered by such a photon to produce a signal. would get pretty complex (pun intended). It never ceases to amaze me how people are frantically trying to create a 'magical' universe even if it flies in the face of all observation. Isn't the universe interesting enough for them? "the model proposed by Cooper shows that charged particle radiation raining down from Saturn's magnetosphere can create the forces from below the surface that are required to eject gaseous jets. Energetic particles raining down from Saturn's magnetosphere – at Enceladus, mostly electrons from Saturn's radiation belts -- can break up molecules within the surface. This process is called radiolysis. Like a process called photolysis, in which sunlight can break apart molecules in the atmosphere, energetic radiation from charged particles that hit an icy surface, like that of Enceladus, can cause damage to molecules within the ice." This is but one mechanism. Ummmmmm..................nope. Absolutely nothing to do with discharges to the surface, as proposed by Thornhill. And still requires a subsurface supply of water. In this article we introduce a process which could actively link a subsurface liquid reservoir with an irradiated icy surface — resulting in an ''Old Faithful'' type outgassing driven by chemical energy deposited from energetic particle bombardment. Radiolysis is an electric discharge process, just like Thornhill proposed. Lol. No it isn't, and no he didn't! Electrical theorist (Lol) Wallace Thornhill and his colleagues suggest there is no geyser of subsurface water analogous to the Yellowstone geyser. They say that if NASA will look they will find that the jets move across the surface. And in their motion across the surface, the ***electric arcs*** that produce the jets are creating the observed channels as they excavate material from the surface and accelerate it into space. And, as I said, the mechanism proposed in the paper still requires a subsurface ocean, which the so-called 'electrical theorist' claims doesn't exist. 'Electrical theorist' must be EU speak for 'Velikoskian woo merchant'! "Fragile pointed out that Cosmos provides astrophysicists an advantage because it has stayed at the forefront of general relativistic magnetohydrodynamics (MHD). MHD simulations, the magnetism of electrically conducting fluids such as black hole jets, add a layer of understanding but are notoriously difficult for even the fastest supercomputers." Electromagnetic effects DO cause large scale structures, and large scale structures can also create electromagnetic effects. It is not so crazy, just physics. As far as Enceladus, I have always felt that a combination of gravitational heating along with it's magnetic equivalent, especially if there is even a small percentage of iron in the solid body under the ice and water, then it will heat just as a matter of moving through not only Saturn's magnetic field in a lateral direction, it is also rotating as it does so, and there is also the Solar magnetic field, which tho weak, still forms the planetary field connections, and thus influences the electromagnetic potentials between Saturn and Enceladus. I believe that this would enhance the heating from just gravitational means and is certainly well within accepted science. It does not take a lot of electromagnetic push and pull to heat a moon/planetary core if it has much iron to it. I do not see why it could not apply to Enceladus no need to add a lot to the total energy budget. There's really too much stupidity here to argue against... somebody would have to argue for hours on end just where these two dolts @cd and @sw go wrong, and in the end get nowhere. Who the hell wants to bash their heads against a wall of bar-room sci-yunce inanities? This is phys.org, folks: the clue is in the name. So why do you have so much problem with people proposing answers which actually fit the observations better than the 'mainstream (big money) theories do? I was always taught that a scientist needs to have an open mind, and if what he is trying to research can be described more fully, in a simpler fashion, then one needs to give it credence and see where it goes from there. Science is a constant process of additions and changes due to more and better information being retreived. Like the whole Dark Matter thing, some think it to be a mysterious super woo thing, when it was originally set as a placeholder name for particles that we knew we would see when we built the right types of detectors (near/far infrared, radio and x-ray ranges etc) to cover different regions of the electromagnetic spectrum, and we are just now getting results from some of them. We can now account for a LOT more of that '85%' dark matter/energy that was only a placeholder 70 years ago. More fully? simpler? Either use the scientific method or not, make it science or not science at all. Your choice is evidently not to do the former, but rather resort to fluffy sentences, mix a sciency-sounding cocktail and to call a rubber duck a duck. "Well, it quacks, doesn't it - what more proof do you want?" But what is being proposed is fanciful nonsense, precisely because NO attempt is made to formulate the "answer" in a scientific manner. There are NEVER any attempts made by the EU to provide any quantitative analyses by which the "mainstream" scientific community might be "won over" to their point of view. Instead, their pronouncements are purely qualitative in nature, and hence fail miserably in their main objective, which is to be taken seriously. @RP, Obviously you do not bother to even read or think through the ideas that I, Personally, have given. Do NOT go basing them on some strrawman fallacies, as I learned the scientific method, which I just described, you do things dilligently in a repeatable fashion, and if someone's predictions can repeatedly match the observed data better then the new theory is taken to be the truth until it can either be disproven or refined...and that IS the Scientific Principle in action, as I learned over 50 yrs ago. You might try actualy responding in a serious fashion to actual science rather than to attack the individual who happens to be making the statements. All you do is make ad-homenim attacks on the individual making the statements in a crude and insulting manner...which is probably what got your other sock puppets banned Again. New Person here, Oct 19th of 2017. So, you are either a retread banned person or of an amazing density nearing that of a neutrino-star's superfluid core. pushing a ridiculous truth. The solar system is young!!!!! We might as well pack our bags and head off to a different place. This place is full of woo! Thankfully, none of it ever makes it to the level where ***real**** scientists actually take it seriously. Or, for that matter, even know of its existence. And what do you know, the jets move as he suggests. the ***electric arcs*** that produce the jets are creating the observed channels as they excavate material from the surface and accelerate it into space. No it isn't, and no he didn't! Merely increasing the charge density will cause radiolysis to arc, simple physics. Only an idiot would equate radiolysis with an electric arc! Wrong. Nowhere in that article does it suggest that the plumes are moving. Except in a vertical direction. The temperatures of the stripes have also been recorded. 180K. Perhaps you could tell us what sort of electric arc operates at that temperature. The blue (false color) auroral ring shows that the current flows into Saturn via a cylindrical electron beam propagating along Saturn's magnetic field and magnetically pinching (known as a Z-pinch) down to the polar region......The bluish 'discharge streamers' can then be understood as channels carved by ***surface lightning ***streaking away from the current vortexes toward the north pole. There, electrons leaving Enceladus to complete the circuit would produce ***extensive cathode cratering***. And the north pole of Enceladus is heavily cratered. The near surface currents would heat the ice and soften or erase earlier craters. Nope. Nothing about radiolysis. Bunch of crap about lightning and cathode cratering and a non-existent z-pinch. Electric discharge machining of planetary surfaces is the most powerful sculpting force in Nature. Until planetary scientists recognize this fact they will continue to be surprised and puzzled by images and data returned from other bodies in the solar system. What it cannot do is, by itself, is explain the H2O gas and ice within the plumes. Hence the need for the liquid reservoir below. So now radiolysis (the molecular decomposition of a substance by ionizing radiation) cannot happen without the presence of a liquid. Comical! I imagine if I mention the photoelectric effect is an electric discharge process jonesdumb will go into a tizzy. He didn't say that, at all. As to radiolysis, as there is a threshold energy level that must be crossed (just like the photoelectric process) the energy required to decompose a solid versus a liquid is MUCH higher. And eve liquids require a pretty high energy level to decompose at any sort of significant rate. Electrons either reach too high an energy level, or even too low, and lose their valence bonding capacity. Mostly metals exhibit this effect because of their electron exchange characteristics. What is it about that sentence that you are having trouble understanding? What has the photelectric effect got to do with anything? That is caused by light, as in photons. Hence the name. I expect pretty much any word in it longer than "the" . . .
You keep insisting I apply your nonsensical "dark" science of the unseen bs to electric discharge processes. I don't have any interest in doing so, what is it about this don't you understand? Except that there is no discharge process. There is possible radiolysis. Which does not create the H2O and ice grains. Nor do the authors claim it can. They need a liquid ocean to supply that. They need a liquid ocean to supply that. That's a completely false statement. The requisite hydrogen is obviously abundant, and just as on comets, the oxygen is being supplied by the discharge occurring to the rocky surfaces. It also provides the energy for the electrochemistry to creates the water vapor and ice. The discharges also creates the complex molecules and "organics" detected in the plume. Lol. Talk about complete woo. Deary me, CD, science really isn't your thing, is it dear? No rocky surfaces, love. Get over it. Point me to a paper that has discovered rock on a comet. Lol. Ever tried maths, sh*t for brains? What is the solar wind flux at, say, 2 AU? What is the H2O output? Do some maths, you eejit. Get back to us. Loon. and all the instruments missed it? As usual? Lol. Dear me, you cretins will believe anything, won't you? EDM. Lol. Question for EU idiots; how are you creating water at a comet, when we know that the solar wind will - a) not do it (to do with energy - look it up) - and b) there is nowhere near enough of it (do the maths). Thick, or what? "Space probe Giotto detected hydrogen ions at distance of 7.8 million km away from Halley when it did close flyby of the comet in 1986. A hydrogen gas halo was detected to be 15 times the diameter of Sun (12.5 million miles)." There is plenty of hydrogen to pull from. Sorry, were Vega and Rosetta measuring the H2O way out in the coma? There is nowhere near enough O- either., even if this mechanism were possible, which it isn't. And where do you think this H halo comes from? The dissociation of H2O. Or does it just magically appear there? Thornhill was quite specific - the OH comes from the solar wind H+ magically combining with non-existent O- from undetectable electric woo going on at the surface. Total fail.